Special Thanks: Taylor Freeman/Freezy Film Productions, aMaes Photography, 224 Apparel, and our beautiful extras! Bul·ly·ing, verb. The participation in any intentional behavior that causes physical, emotional, or social damage, through the abuse of power. Nobody deserves to be bullied. Since when was it ever cool to be a 'mean girl'? Well, it certainly isn't cool in our book. From name calling on social media, spreading rumors about your peers, to harming someone face to face; bullying has become a widespread problem. Shattering someone's self esteem certainly isn't funny, and is something that is not to be taken lightly. Ladies and gentlemen, why do we do this to one another? It's a whole lot easier to be nice than it is to be mean. As Plato said, "be kind, for everyone you meet is fighting a hard battle." You never know what issues someone is dealing with in their personal life, big or small. Life brings us challenges, but why intentionally make another person suffer? Targeting anyone as the subject of abuse not only shows a lack of compassion, but a lack of humanity as well. One thing is certain- bullying is an enormous issue. Saving the world from bullying is a pretty large feat (although we're up for the challenge). So, what exactly can you do? We're starting small. We're starting with the people we know and love. Start within your circle of friends, your sorority, your family; anything you're involved in where you have felt the sting of someone being bullied. If you're witnessing bulling, stand up for the victim. If you're the target, stand up for yourself. And if you're the bully... well, it's never too late to turn things around. 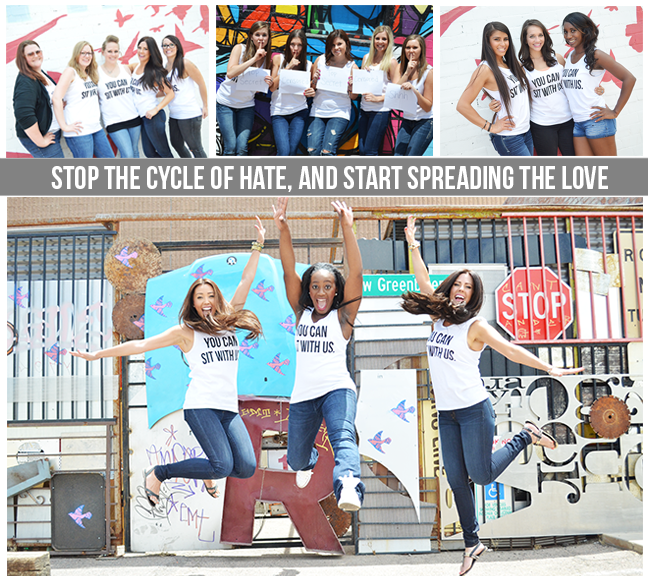 We're on a mission to stop the cycle of hate, and start spreading the love. Join the movement. 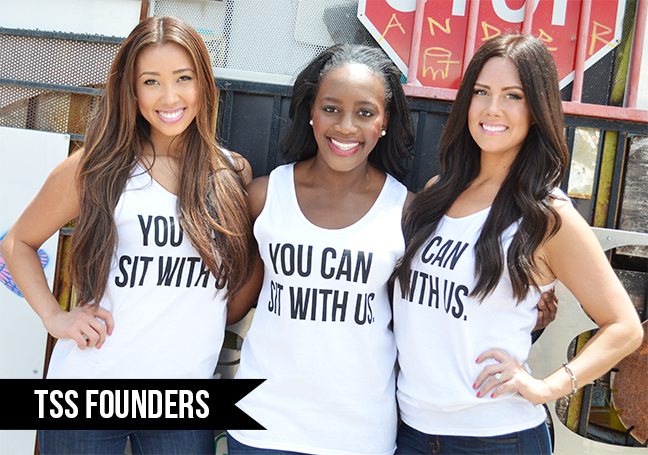 Come and grab a seat, YOU Can Sit With Us. This is our first step in a cause we hold dear to our hearts. Next, we want to hear from YOU. We ask that you please share your bullying experiences with us; whether you've witnessed it, been the target, or been the bully yourself. We want to hear you, we want to hear your voice. Please leave your comments and a contact email below, so that we can get in touch with you for future posts regarding our You Can Sit With Us campaign. Thank you! I was bullied all through middle school. I myself was a bully in high school. I think that this campaign is so great, because anti-bullying is so important and most people look at sorority girls as bullies because we "think we're better than everyone else." I applaud ya'll in this campaign ladies! Ladies...this is OUTSTANDING! I was moved to tears seeing amazing women like you standing up against bullying and fighting to spread kindness. In high school, I was a bully for about a year until realized what I was doing was wrong. When I changed my ways and became a better person, the group of girls I had associated myself with turned on me and then bullied me. I understand the perspective of both sides - how lonely and terrifying it is to be the victim and how easy it is to be sucked into negativity and become the instigator. This message of hope and positivity is one that everybody can learn from. Thank you so much for taking a stand and creating such an incredible campaign. I cannot wait to see where it takes you and would love to be involved in anyway possible. This issue effects all of us and we all have the power to stop it. So excited to join the movement! Hello lovely ladies. I am a sister of Kappa Delta at Michigan State University. Bullying is a huge issue and I would love to get my chapter, and the women in chapters at MSU very involved in this campaign.By selling tshirts, promoting non-bullying, and starting a movement, together we can impact MSU's campus and stop bullying not just in Greek Life, but the community! I would especially like to tie this into our Philathropy, which is Girl Scouts, and teach the younger women about how bullying affects them, and how Kappa Delta can help stop it and make them feel beautiful. We also have a Confidence Coalition that allows women to know they are beautiful no matter what! I feel like your campaign fits in perfectly, and I want to get invovled...now! As a mom my greatest fear is my daughter being subjected to bullying. Schools are pretty scary these days w/so many forms of bullying open to kids these days. I was picked on in school growing up for several reasons, some were personal & others just because. I was so glad to be apart of this video & to show my daughter that LOVE is so much bigger than hate. It was a great teaching lesson for her & I hope everyone shares this to spread the love. This is such a great video! So keep sharing everyone!! And a huge thanks to the TSS Founders for taking charge in such a big issue today! Love this site!! Hi girls! 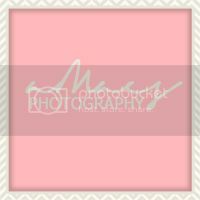 I'm a sister of Alpha Phi from the Eta Omega Chapter at Towson University. I was subjected to bullying in middle school by a group of girls. As you know, middle school is the stages in which pubery starts to hit and I happened to go through a rough patch during puberty. I had braces, glasses, and was a little on the heavier side. I was pushed into lockers, made fun of everyday on my school bus, and even during my lunch period. I used to come home crying to my mom every day and used to wear rings on each finger to school because I thought I was going to be beat up. I took a stand against bullying and it's something I am extremely passionate about advocating for. No one should ever have to feel ashamed of who they are. I would LOVE to get involved. This was an awesome video!!! Why is this my first time seeing it?!! Awesome stuff, wow!! Reposting, Sharing! Thanks so much for spreading the message! !